As the year 2000 approached, lists of all kinds began to appear ranking the most important, most popular, most significant…etc…people and things of the last century. Time magazine rated Franklin Delano Roosevelt the most important and significant President of the United States in the 20th century. 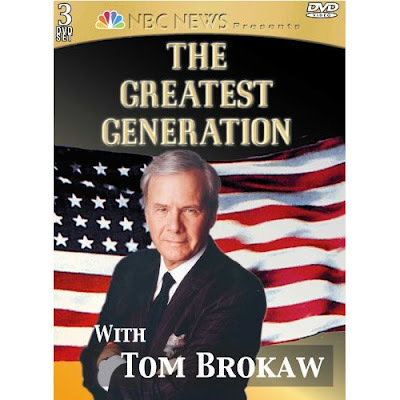 He was the leader of our nation during the time when “the greatest generation” came of age during the course of The Great Depression and WW II. The stress of leading the U.S. and working with its allies through these two cataclysmic events took its toll on his health, and it was important for him to find a way to relax every day so that he could continue to face the challenges of his responsibilities. One of the primary ways in which FDR dealt with the stress of his responsibilities was to convene each day in his second floor study in the White House a gathering of friends and associates that he called “The Children’s Hour.” This room was FDR’s favorite room in the White House, filled with so many of the things he loved: model ships, naval prints and maps on the walls, his beloved stamp collection, book cases overflowing with his favorite texts, and overstuffed leather chairs and sofas in which visitors could lounge in the peaceful atmosphere of the room. It was in this room that FDR transacted much of the important business of his Presidency – but NOT during “The Children’s Hour.” During this interlude, which might last for a couple of hours, no business of state or any serious discussions of any sort were to be undertaken. 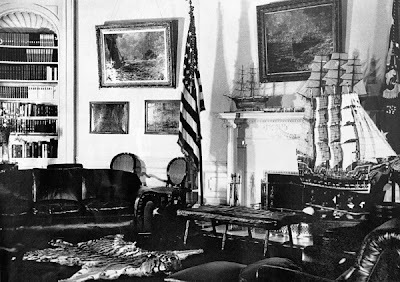 FDR’s second floor study in the White House. “The Children’s Hour” took place here when he was in Washington, D.C. It was a time FDR set aside to meet informally with his political family and friends. He had begun this tradition during his years as Governor of New York, and had institutionalized it during his years in the White House. The list of individuals who attended these gatherings included Harry Hopkins, Frances Perkins, “Missy” LeHand, Edwin “Pa” Watson, cabinet members, visiting politicos from across the U.S. and Senate and House members who felt like “stopping by “to have some “fun” with the President. As mentioned above, no talk of politics, Depression or war was allowed. Jokes, gossip, and funny stories and anecdotes from the day were the topics of conversation. FDR would tell his own tales while engaging in one of his favorite pastimes, that of mixing drinks for all of his guests. He would sit in his wheel chair next to a table filled with the alcoholic beverages necessary to make any kind of drink for his visitors. Martinis seemed to be the preferred drink. As people would filter into the second floor study, they would approach the President, say “hello,” and the President would ask them what they would like to drink.The guest made a request and the President made the drink and gave it to him or her. As the “Children’s Hour” went on the atmosphere became loose, loud and full of gaiety. As he mixed drinks for his guests, he would increase their strength if he wanted to create a more relaxed and uninhibited atmosphere. At the same time, he would linger over his own drink for an extended period of time. FDR enjoyed watching his guests respond to the alcohol. Some guests felt the effects of this trickery and dumped their second and sometimes third drinks into the nearest potted plant. It was later brought to FDR’s attention that the plants in the room were dying. No surprise! 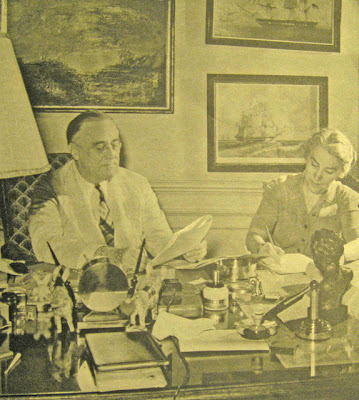 FDR with his secretary “Missy” LeHand, who served him in that capacity from 1920 until 1941when she suffered a stroke. Rumors of a romantic relationship between them have persisted. She was totally devoted to his happiness and well-being. FDR, it must be said, was quite a gossip and was always more than eager to hear the latest story or rumor making the rounds of Washington. As a matter of fact, FDR and J. Edgar Hoover got along quite well during FDR’s years as President. 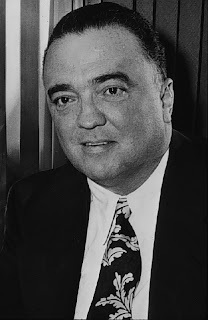 Hoover had the dirt on most everyone and FDR would often call J. Edgar on the phone and ask him what tidbits of scandal he had uncovered. Hoover, being a gossip himself, and a collector of “secrets,” was more than happy to oblige. Even when FDR was in residence at Hyde Park, his family home on the Hudson River, or on his weekly excursion on the Presidential yacht, The Potomac, the observance of this “Children’s Hour” ceremony was brought along with him. Poker games with members of his cabinet were another activity that provided an escape from the daily worries of his Presidential duties. Again, drinking , jokes and gossip were the rules of etiquette at these gatherings. Hoover was the source of some of the gossip that FDR enjoyed. Why was this interlude of entertainment and down time referred to by FDR as “The Children’s Hour?” What does this term have to do with the President and his need for relaxation? The answer leads to a coincidence. 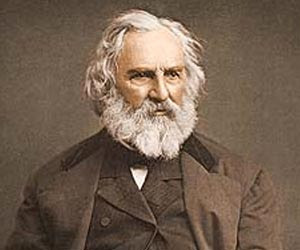 In 1882 Henry Wadsworth Longfellow published a poem titled “The Children’s Hour.” It is one of the most beautiful, touching American poems ever written in honor of the love a father feels for his children. It is an expression of the joy and contentment that FDR, perhaps, longed for during the tempestuous times he was leading the nation. Here is a video of a recitation of the poem. Listen to the feelings of domestic comfort and happiness at the core of the poem. And here is the great coincidence. Franklin Roosevelt was born in the same year Longfellow published this poem, 1882. Growing up, FDR was undoubtedly familiar with these verses and, years later, used the title to this beautiful poem to give a name to the pastime he created for himself in trying to recreate the serenity and comfort he so much needed and desired. My imagination connects the children of the poem with the friends FDR surrounded himself with during his own “Children’s Hour.” FDR often remarked that he felt like one of the loneliest people alive. Power and responsibility can isolate a public figure, and this feeling must have been a severe burden for the naturally social, cheerful and optimistic President. During the daily respite of “The Children’s Hour,” a radio would be playing in the background in the second floor White House study. Music would have added another dimension to the relaxation of the moment. What would have been playing? It’s only a small leap of imagination to fill in this part of the story. Here is a popular song of WW II sung by Lana Horne that, more than likely, played in FDR’s study during “The Children’s Hour.” I use this video rendition of the song (“Stormy Weather”) because it features one of the most popular pin-up girls of WW II. The video itself is a clip from the film “Stormy Weather” (1944), an all black cast Hollywood production that is well worth watching because of Lena Horne’s performance and what is perhaps the best dance sequence ever put on film performed by the Nicholas Brothers. Needless to say, FDR’s wife, Eleanor, only rarely put in an appearance at “The Children’s Hour.” She had been raised a proper Victorian woman, and she worked very hard in support of her husband and his programs. Her focus was on all of the work to be done, and she saw this gathering as a waste of precious time that needed to be spent on pressing issues. She was always writing notes to Franklin telling him about this problem, that issue, a new idea or a controversy that needed to be handled. One of the last things Franklin saw before he went to bed at night was a stack of handwritten notes on his bedside table from Eleanor, demanding his attention. She was an indispensable part of his work, but she sometimes drove him to distraction. 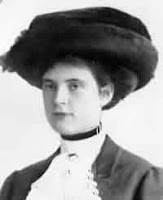 Their daughter, Anna Roosevelt, once related an incident in the White House during which Eleanor’s petulant insistence upon her husband attending to a stack of official papers and reports during his “cocktail hour” resulted in FDR flinging the entire stack of papers across the room. The integrity of “The Children’s Hour” was to be maintained. 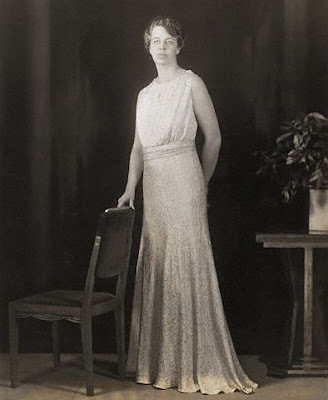 Eleanor Roosevelt earlier in her married life to Franklin. Both her father and brother had died of complications from severe alcoholism. This was another reason why she had little patience for her husband’s “children’s hour.” She could not stand to see people in an inebriated state. A DIGRESSION ON ELEANOR, FRANKLIN AND LUCY MERCER. Their relationship had evolved into a political, rather than personal, partnership because of Eleanor’s discovery in 1918 of an affair he was having while he was serving as Undersecretary of the Navy in President Woodrow Wilson’s cabinet. On his way back from an official trip to England (he met Winston Churchill, who did not think much of the young man) on a U.S. naval ship, he came down with a severe case of the Spanish flu. Upon arrival in New York City, FDR was brought home to be cared for. Eleanor, between her nursing duties, unpacked his suitcases and discovered a packet of letters from Lucy Mercer, who was Eleanor’s social secretary and, practically speaking, a close member of their family circle. When Franklin recovered she confronted him with the letters and offered him a divorce if he wanted one. But FDR’s mother forbade it and threatened to cut Franklin out of the family’s inheritance if he proceeded. She was not about to allow her son to sacrifice his future political career over this matter. Eleanor gave Franklin an ultimatum: either promise to never see Lucy Mercer again or she would seek a divorce herself. He promised to never see her again. He did not keep this promise. Lucy and FDR kept in contact over the years. He sent her a secret invitation and ticket to attend his inauguration as President in 1933 and supplied her with a private car. Their “secret” meetings were frequent enough that the Secret Service had a code name for Lucy Mercer, “Mrs. Johnson.” She visited him in the White House a number of times when Eleanor was away, saw him at the winter White House in Warm Springs, Georgia, and was with him when he died there of a cerebral hemorrhage on April 12, 1945. Many historical sources consider her to be the love of his life. 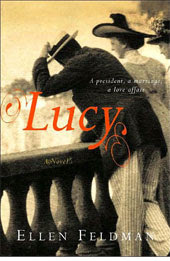 I highly recommend the book Lucy, by Ellen Feldman, a historical novel told in Lucy’s voice that offers an interesting perspective on the story of their relationship. So Eleanor’s presence at these “Children’s Hour” gatherings was very rare. On one occasion, however, the following incident supposedly occurred. The atmosphere was loose and loud in the second floor study when the door opened and Eleanor strode into the room. She raised her head slightly and gazed at the assembled people, looking down her nose a bit, giving every indication of her disapproval of this waste of precious time. The guests became quiet, wondering what to make of her surprising appearance. FDR turned to her and asked what she had been doing all day. She answered that she had attended a number of important meetings and had gathered some crucial information concerning official White House business. The suggestion was that she had been busy at work while those present had been wasting time drinking and gossiping. As she walked further into the room she passed close by her husband’s wheelchair, which was placed next to the table full of alcoholic beverages necessary for him to mix drinks for his guests. It’s called a “martini,” dating from 1899, because of the famous brand of vermouth, “Martini and Rossi,” which was popularly used to make this drink. 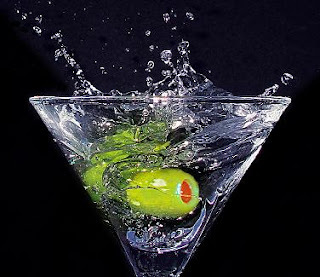 Other word historians think there actually was a bartender named Martini, either Spanish or Italian, who invented the drink and gave it his name, thus immortalizing himself. Take your pick. What might have been playing on the radio in the background as the preceding incident took place? How about this song, one of the classics of the big band era? I equate it with the ever-present optimism that FDR modeled for those around him. And, just for fun, and in honor of “The Children’s Hour,” let’s take a look at the “jitterbug” dancing that was done by young people (children?) during the years FDR was in the White House. Although he could not dance himself, I could imagine him daydreaming of doing this dance with a woman he loved. And who would that be? And if you have the time, here is a nine minute film that was shown as a short subject in movie theaters in 1944. It takes viewers through the older dances (the waltz, for example) that contributed steps to the “jitterbug” and “boogie-woogie” dance craze of the 1940s. It’s a terrific film and an interesting historical piece, but if you are short of time (which I hope you are not) fast forward to the last half of the film when the dancers really show their stuff. It’s amazing! 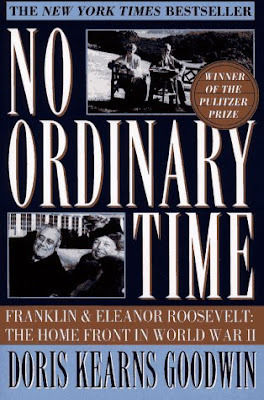 FINISHING UP: FDR, “THE CHILDREN’S HOUR,” AND ELEANOR. The complex nature of the relationship between Franklin and Eleanor has been written about and speculated upon extensively. They were not cardboard characters living two-dimensional lives. My post has been an attempt to bring a measure of consideration to their humanity, their strengths and weaknesses and the love and loss they felt for each other. Near the end of FDR’s life in late 1944 and early 1945 he was extremely ill. The picture below illustrates the extent to which the pressures of his work had taken their toll on his health. FDR just prior to his death. The Presidency has taken its toll. Compare this picture with the one at the beginning of this post. No matter how ill he was, however, he still maintained the tradition of “The Children’s Hour.” It is a touching detail of the intricacies of their relationship, that near the end of his life FDR asked Eleanor to come in to his beloved second floor study to mix and pour the martinis and other drinks for his guests who came for his daily ritual gathering. She did so without complaint or judgment. And it is with that loving gesture toward him in my mind that I wish to end the story. I dedicate this post to Ms. Goodwin. This book won the Pulitzer Prize and is the finest work of historical biography I have ever read. I would be terribly remiss not recommending it. 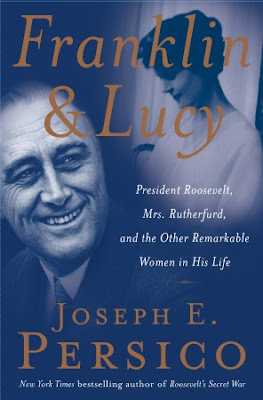 This book deals with the women in FDR’s life who shaped and influenced his character. It centers on Lucy Mercer, but includes a number of others who played crucial roles in his life. FDR’s infidelity is shown to have helped create the energy in Eleanor to become one of the most influential women in history. Most of Eleanor’s finest achievements occurred after Franklin’s death. Mr. Persico’s book “Roosevelt’s Secret War” is an excellent and interesting read, highlighting FDR’s penchant for secrecy and espionage.